Got Blood? Will you consider giving the gift of life? At the end of July of 2016 we received news that every parent never wants to hear – you need to rush your son to Boston Children’s Hospital becuase of an unknown issue with his blood. Wow, just wow. After eight long hours in the emergency room it was suspected that our then 17 month old little guy had potentially contracted ecoli which was wreaking havoc with his blood. Two transfusions and 8 days later, including 6 in the NICU, Frankie came home but was subjected to months of tests and bloodwork. Today he is thriving and showing no signs of the illness that struck. Our family was treated like royalty by the Boston Children’s staff and by family and friends after returning home. We wanted to take action to show appreciation for all the acts of kindness. We thought helping to replenish the supply through organizing a blood drive (now annual blood drive) was the best gift – asking for friends and family to consider giving the gift of life. As parents of a child who benefited from a transfusion, it is our honor to organize this drive. 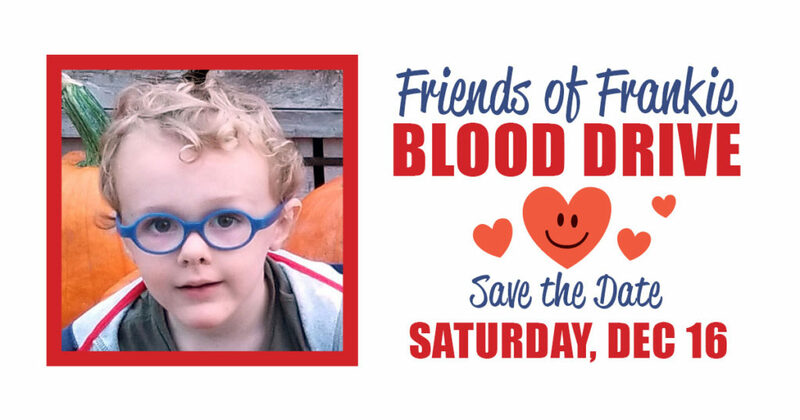 Will you consider joining our virtual blood drive and become a ‘Friend of Frankie’?